As some of you may have noticed, I have an “Ask The Opinioness“ box on the right-hand side of my posts, encouraging interested readers in having me review films, books or recipes. Well, I’m delighted to say, someone emailed me asking me to review their recipe!! Fiona Morgan, aka Fi, is an artist and blogger at Spaces Between the Gaps. She has created an “Art Filled Seasonal Cookbook that happens to be Vegetarian“ filled with delish sounding recipes, some of which are vegan or can be veganized. I decided to cook Fi’s Gyoza or Japanese Dumplings. 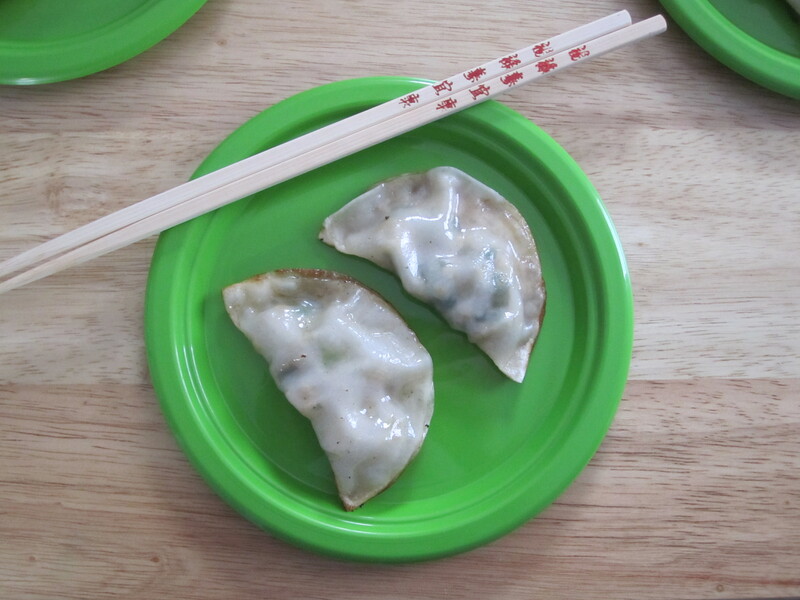 Also known as pot stickers, these half-moon shaped dumplings consist of meat or a vegetable filling wrapped in a piece of round dough, then sealed by pressing the edges together with egg batter or water. They are fried on one side and then steamed in the pan. The thought of using won-ton or dumpling wrappers often scares people. But I’m here to tell you that they’re not only much easier to use than I anticipated but fun to make as well! Almost all of the ingredients were easy to find at my local grocery store and Whole Foods. But the gyoza wrappers were a bit trickier. Luckily, in Boston we have Chinatown as well as Super 88 Market, an East Asian grocery store. I confused the woman working at Super 88 when I asked for gyoza wrappers. I went online to check the proper pronunciation first and everything! But once I said, “They’re like won-ton wrappers but round,” she screamed, “OH, you want dumpling wrappers!” So off we went to pick up the dumpling wrappers. As it was early in the morning, when my boyfriend and I checked out at the register, the same helpful lady waited on us again. As she rang up our napa cabbage (also known as Chinese cabbage) and gyoza/dumpling wrappers, she shared her excitement with us that we were cooking. Thrilled that we were going to use mushrooms, particularly after I told her we had shitake mushrooms at home, yet she was confused as to why we weren’t buying pork. She even kept shouting us instructions as we were leaving the store! Crispy on the outside, chewy on the inside, this recipe is fabulous for hors d’oeuvres, appetizers or even a meal for two. The sweetness of sherry, zesty ginger, salty soy sauce, pungent garlic and scallions along with the cabbage, tempeh and mushrooms marinate together into one delectable bite after another. So thanks, Fi for introducing me to this tasty dish! And if YOU would like me to review your recipe (or a restaurant, book, or movie), be sure to drop The Opinioness a line. And I’ll gladly do what I do best…share my opinions! In skillet, heat olive oil on high heat. Add finely chopped tempeh. Cook for approximately 5 minutes until golden brown. Set aside. To make the filling, put salt in large bowl. Then add garlic, then sherry, then sesame oil, then soy sauce, then ginger. Mix well each time after adding new ingredient into bowl. Then add cabbage, scallions followed by cooked tempeh and mushrooms. Mix well. To cook dumplings, heat large skillet on high heat. Pour sesame oil in pan. Place dumplings. Fry on one side until golden. Add 1/3 cup of water and immediately place lid on top to steam the dumplings. Steam for exactly 3 minutes. Then remove dumplings with spatula and drain on a paper towel. Continue with rest of dumplings. Serve with hoisin sauce, sweet chili sauce or soy sauce. Yields approximately 30 dumplings. devoted to serving movie buffs and foodies..
I’m so glad that I came across this! I’ve been looking for a chinese dumpling recipie but without pork in it-I’m definately going to have to try this out, they look yummy. Glad to hear it…let me know how it turns out!